Normally when I arrive in a new city, I try to get there as early in the day as possible, but when I left Ireland bound for Paris, that was not to be. Thick fog in Dublin delayed flights and it was winter when the daylight hours are short to start with. By the time I got into Paris and found the place where I was staying in Montmartre, I found myself wandering the streets of Paris at Night. I have to say though that Paris at night is not a bad way to start at all! 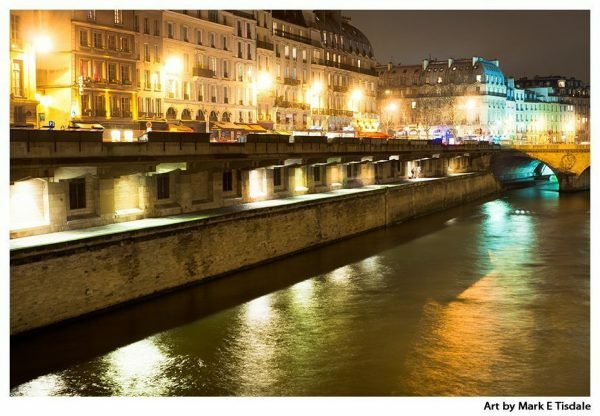 As you can see from this print of Quai Saint-Michel in the city lights, Paris is quite beautiful, perhaps romantically so, after the sun vanishes from the streets. This was the first of many days and nights I would wander along the Seine in the heart of Paris. And it was never a disappointment. I had made my way to this part of Paris simply to see Notre Dame de Paris at night, but as I exited the Paris Metro into the night air… Well, that was the moment when I discovered the real beauty of Paris. I still love the way Paris has a fixed height for buildings in the city core. I love skyscrapers, but there is something very humanizing about the scale of Paris. This is one of my favorite prints of Paris At Night. I think simply because it features the architecture of the city rather than its landmarks. It has a real flavor of Paris in the cold night air, so much so that I feel as I could step back there even now. 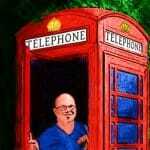 Do you feel the same sense of immediacy as if this is happening before you right now?